DC ceiling fan Fraser Hugger - ideal for low ceilings, brushed chrome finish, 4 wooden blades, 6 fan speeds - forward and reverse, operated by included remote control, for indoors. 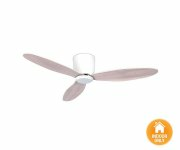 DC ceiling fan Fraser Hugger - ideal for low ceilings, white finish, 4 wooden blades, 6 fan speeds - forward and reverse, operated by included remote control, for indoors. 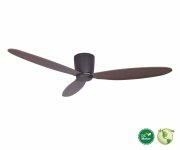 HUNTER ceiling fan Low Profile - ideal for small and low rooms, brushed nickel finish, 2 varyingly long sets of 5 wooden blades each, chocolate/ maple (reversible), 3 fan speeds, for indoors. DC ceiling fan Radar Hugger - ideal for low ceilings, brushed chrome finish, 3 teak finish wooden blades, 6 fan speeds - forward and reverse, operated by included remote control, for indoors. 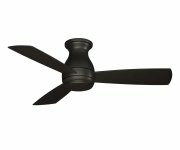 ELIZA Hugger DC-ceiling fan, brushed nickel finish, energy-efficient DC motor with 3 brushed nickel finish plastic blades, 6 speeds forward and reverse, operated by included remote control, for indoors and outdoors (damp location). IRENE Hugger ceiling fan, brushed nickel finish, energy-efficient DC motor with 3 walnut finish wooden blades, 6 speeds forward and reverse, operated by included remote control, for indoors and outdoors (damp location). 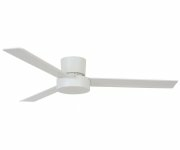 Ceiling fan Lagoon Hugger - ideal for low ceilings, white finish, 3 white ABS plastic blades, 3 fan speeds operated by included wall control, forward and reverse, for indoors and outdoors (damp location). 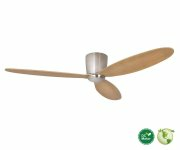 HUNTER ceiling fan Low Profile - ideal for small and low rooms, white finish, 2 varyingly long sets of 5 wooden blades each, white/ maple (reversible), 3 fan speeds, for indoors. DC ceiling fan Radar Hugger - ideal for low ceilings, white finish, 3 light oak finish wooden blades, 6 fan speeds - forward and reverse, operated by included remote control, for indoors. HUNTER ceiling fan Soho, brushed nickel finish, 3 wooden blades chocolate/maple (reversible), 3 fan speeds, included wall control for fan speeds, for indoors. ELIZA Hugger DC-ceiling fan, brushed nickel finish, energy-efficient DC motor with 3 gray ash finish plastic blades, 6 speeds forward and reverse, operated by included remote control, for indoors and outdoors (damp location). IRENE Hugger ceiling fan, textured bronze finish, energy-efficient DC motor with 3 walnut finish wooden blades, 6 speeds forward and reverse, operated by included remote control, for indoors and outdoors (damp location). Ceiling fan Lagoon Hugger - ideal for low ceilings, black finish, 3 black ABS plastic blades, 3 fan speeds operated by included wall control, forward and reverse, for indoors and outdoors (damp location). HUNTER ceiling fan Seville - the fan for small rooms, brushed nickel finish, 5 wooden blades maple/ grey (reversible), 3 fan speeds - forward and reverse, for indoors. 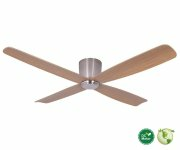 ELIZA Hugger DC-ceiling fan, brushed nickel finish, energy-efficient DC motor with 3 walnut finish plastic blades, 6 speeds forward and reverse, operated by included remote control, for indoors and outdoors (damp location). IRENE Hugger ceiling fan, white finish, energy-efficient DC motor with 3 walnut finish wooden blades, 6 speeds forward and reverse, operated by included remote control, for indoors and outdoors (damp location). Ceiling fan Lagoon Hugger with LED light - ideal for low ceilings, white finish, 3 white ABS plastic blades, 3 fan speeds and light operated by included wall control, forward and reverse, for indoors and outdoors (damp location). 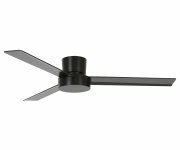 DC ceiling fan Radar Hugger - ideal for low ceilings, oil-rubbed bronze finish, 3 dark oak finish wooden blades, 6 fan speeds - forward and reverse, operated by included remote control, for indoors. HUNTER ceiling fan Seville - the fan for small rooms, white finish, 5 wooden blades white / light oak (reversible), 3 fan speeds - forward and reverse, for indoors. 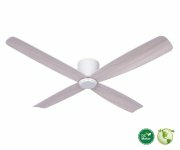 ELIZA Hugger DC-ceiling fan, white finish, energy-efficient DC motor with 3 white finish plastic blades, 6 speeds forward and reverse, operated by included remote control, for indoors and outdoors (damp location). IRENE Hugger ceiling fan, black finish, energy-efficient DC motor with 3 walnut finish wooden blades, 6 speeds forward and reverse, operated by included remote control, for indoors and outdoors (damp location). Ceiling fan Lagoon Hugger with LED light - ideal for low ceilings, black finish, 3 black ABS plastic blades, 3 fan speeds and light operated by included wall control, forward and reverse, for indoors and outdoors (damp location). 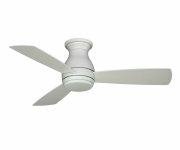 HUNTER ceiling fan Savoy - THE CLASSIC, white finish, 5 blades white/ light oak (reversible), 3 fan speeds - forward and reverse, for indoors. 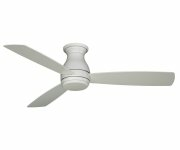 ELIZA Hugger DC-ceiling fan, white finish, energy-efficient DC motor with 3 gray ash finish plastic blades, 6 speeds forward and reverse, operated by included remote control, for indoors and outdoors (damp location). IRENE Hugger ceiling fan, brushed nickel finish, energy-efficient DC motor with 3 barn wood finish wooden blades, 6 speeds forward and reverse, operated by included remote control, for indoors and outdoors (damp location). 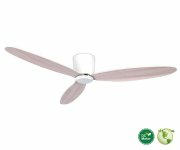 ELIZA Hugger DC-ceiling fan, white finish, energy-efficient DC motor with 3 walnut finish plastic blades, 6 speeds forward and reverse, operated by included remote control, for indoors and outdoors (damp location). IRENE Hugger ceiling fan, white finish, energy-efficient DC motor with 3 barn wood finish wooden blades, 6 speeds forward and reverse, operated by included remote control, for indoors and outdoors (damp location).